Discussion in 'Hardware' started by Lassar, 1 Nov 2018. Lassar Lean Mean Fighting Machine ! 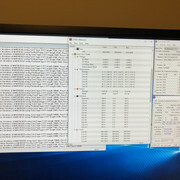 Currently OCing my 8086k @ 5.1Ghz on 1.35 volts with a LLC of level 6 putting the V core on 1.36. Im running a custom loop and seeing a peak temp of 89c whilst running P95 Blend. All seems stable. I have tried 5.2 and 5.3 but it wanted silly volts. Anyone got opinions on my peak temps? too high? They’re fine. You’ll see a good reduction if you delidded the chip, but I wouldn’t worry about those peaks. Thanks MadDutchDude. Been running Prime95 Blend now for about 16 hours. Temps are fluctuating between 60-75 then spiking occasionally up to the mid 80s. Highest recorded temp was 91c on one core. Interestingly the PC would pass Custom FFT and Cinebench at 1.285v but crashed in blend after 15 mins. Seems I have a standard chip as it likes 1.35v like everyone else. I won’t be delidding. Well not immediately anyway. I have 3 years warranty on it so don’t want to lose it. 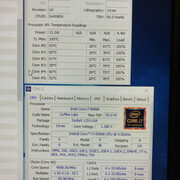 Interestingly compared to my old i7 920 this chip is bloody toasty! If you were in the US, I’d offer. I don’t believe that you are, though. The i7 920 had a "monstrously huge" die of over 260mm2 while the 8086K is around 150mm2, that massive reduction in contact area between CPU and IHS matters a whole lot (and thats before we even get to the pigeon excrement they use as thermal paste). It could be magical space goop, pumping 1.35V (~170W-180W) through a 150mm^2 die is going to get hot. That's more than 1 watt/mm^2! It’s also severely hampered by the seriously thick layer of silicon that Intel use... as Roman “der8auer” has proven with the 9900K. The 8700K isn’t as bad, but still not great. Well I just completed 25 hours of Prime Blend. Max temp was 91c on one core. Rest were 88-89c. 5.1 GHz at 1.35v. Don’t think that’s a bad achievement? I did get a Cinebench score of 1703 at 5.2 but there is no way in hell it would pass P95. You’re already right in the edge of stability with those volts and clocks. Nice one! Maybe I’ll have to organize a “when I’m back in the UK” delid and have everyone send them in for me to do while I’m there. I'm on my 5th delid for friends and family now. So if you are in the market for it happy to help or loan you the tool to do it. 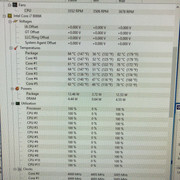 OK so ... whilst you said my Temps were ok TheMadDutchDude i wondered what I could get by just down clocking to 5.0Ghz. Pleased to say just passed 25 hours P95 Blend with the highest peak of 81/82c on one/two cores. Not bad for 1.28v (1.29 occasionally due to LLC Lvl6). 1.28 was the first voltage I dialled in too so may be able to go even lower? What you think? Ambient temp varied between 21c to 23c. It might go a little lower, but I wouldn’t bother. It’s already stable and unlikely to go much lower. Much. I’d be very happy with that.